Email overload is a real drain on productivity and no one enjoys dealing with piles of messages every day. In fact, email is so universally disdained that a whole crop of third-party apps and services have sprouted to replace or improve webmail providers like Gmail, Yahoo, or Microsoft. Boxer, which launched in June, might now have an edge on competitors such as Mailbox with a recently announced integration with the SaneBox email filtering platform. While both Boxer and SaneBox work with Gmail, Yahoo, iCloud, Outlook, and Hotmail if you access them on the desktop, Boxer's mobile app now offers SaneBox customers email filtering on their iPhones and iPads, as well. It's an interesting collaboration that may spur downloads of Boxer, considering SaneBox is a wildly popular platform that analyzes your inbox, looking at whether you're connected with senders on social media platforms or if you've ever replied to a message before to determine which messages to prioritize. Sanebox tucks any that it deems less important into a separate folder you can peruse later. PCWorld's Liane Cassavoy wrote last year that in 15 minutes SaneBox whittled her Gmail account from 32,000 messages (1,000 unread) to 1,200 messages (100 unread). I've used the service myself with similar results and especially liked a folder called "SaneBlackHole" into which you can put unwanted messages--doing so tells SaneBox to send messages from that sender directly to trash. 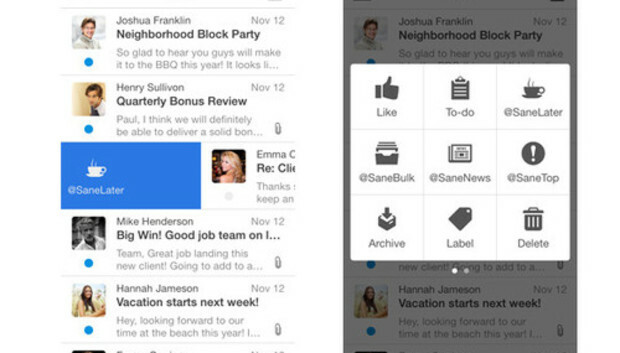 SaneBox can also tell if a message is a newsletter and send it to a folder called "SaneNews." And if SaneBox ever puts a message in the wrong folder and you move it to a different one the platform learns from your action and won't make the same mistake again. As for Boxer, it imports messages from any native email platform but adds unique features like the ability to "like" an email, an action that lets a sender know you've acknowledged a message without having to actually reply. You can also set up custom pre-written responses that you can quickly tap into a message reply, such as "OK, sounds good" or "What time works for you?" It also includes a "to-do" feature you can use to add a due date and priority to a message, assign a task to someone and mark it "done" once complete. SaneBox is free to try for two weeks; after that it starts at $6 a month or $39 a year. Boxer's iOS app is $0.99 and the company says an Android version is in the works.